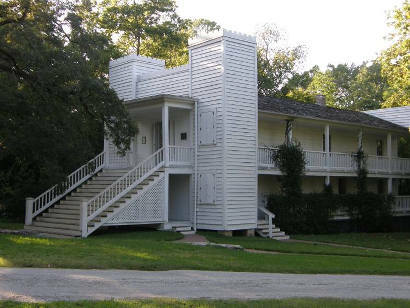 Sam Houston's Steamboat House, Huntsville, Texas. 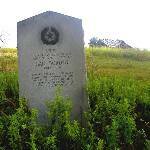 Built in 1858 by Dr. Rufus Bailey, 1858-62 president of Austin College, as a wedding gift for son. Unusual house caused such joking, however, the couple refused to live in it. 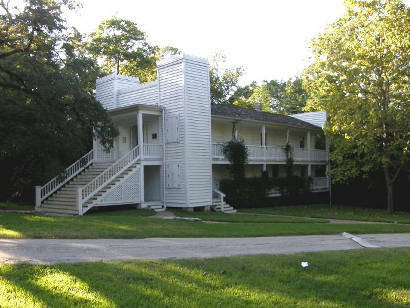 In 1862, after Sam Houston left governorship of Texas, he rented Steamboat House, and here he died in 1863. His funeral was held in the upstairs parlor. 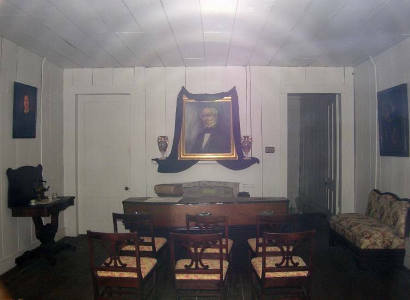 In 1933 Houston businessman J. E. Josey bought house and gave it to state. Texas Centennial Commission restored building, moved it here 1936.